Sorry for the blog hiatus, but Life was, well, Life. But welcome back aboard the Poop Deck. Food and drinks are free if you brought ’em aboard. Captain’s Log. Diaper Date 2623. The first real snow fall of the year has occurred. It is a paltry 1.5-3 inches. Barely enough accumulation to notice. However, it is enough for Destructo Jr. (formerly known as Diaper Dweller, I considered “Pees while Standing” as a new moniker but thought better – mainly cause he hasn’t mastered the whole standing thing). He is fascinated with it. He wants to stand, stomp, -and sit in it. Now that’s to be expected. What parents don’t consider is what snow means to toys. They become the canaries in the mine caverns of frigid ice. They get thrown, dropped, encased in snow just for fun. 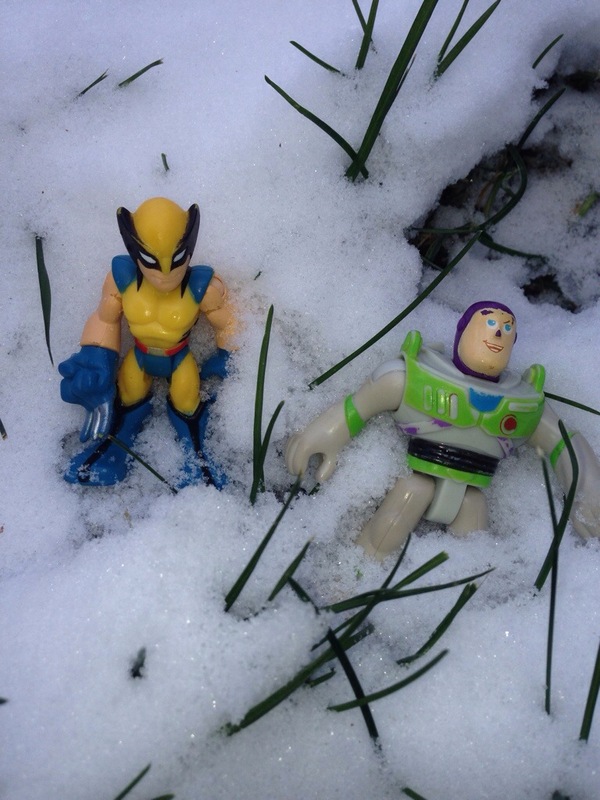 Currently, Wolverine and Buzz Lightyear appear to be subjected to a cruel and complicated form of interrogation. They have been dunked, thrown, balled up, and even threatened with the dreaded yellow snow (thanks to the laziness of the family dog). I hear no questions, yet I hope Wolverine and Buzz soon reveal the location of the secret rebel base lest they be lost to the frozen tundra of our backyard. This is a dangerous place for toys- just ask Captain America what happens when you get frozen and forgotten in a large block of ice for a few decades. So let this be a PSA for the care of toys during the winter months. Keep a head count, watch out for black ice, and yellow snow. Your toys will thank you later.